Carol King reports on the flamboyant aerobatic antics of Italy’s most skilled pilots. When it comes to creating a dazzling spectacle in the sky, the pilots of the Italian Air Force’s Frecce Tricolori (Tricolour Arrows) are hard to beat. Their displays are arguably the most colourful in the world and ooze Italian exuberance. 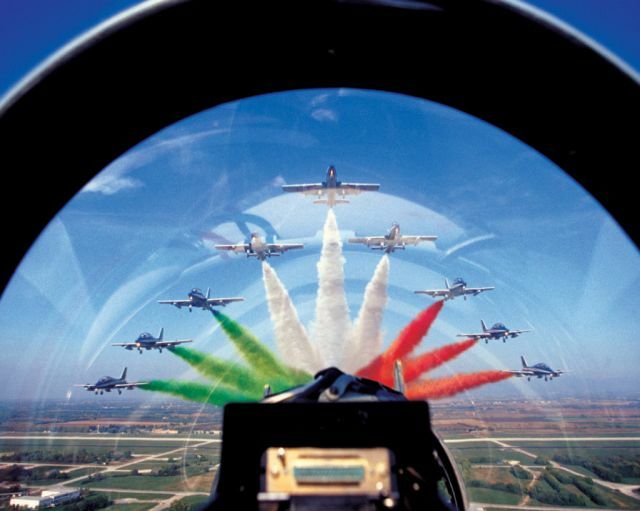 The Frecce Tricolori is the largest aerobatics display team in the world. The team’s pilots are known for their series of highly synchronized manoeuvres in specially modified Alenia Aermacchi MB-339A jets, the MB-339PAN, which have made the Frecce Tricolori one of the world’s premier aerobatic teams, as well as one of the most popular. Their spectacular displays consist of a formation of nine aircraft with a soloist, who pushes his aircraft to the limit. Even before they hit the sky to perform tight turns, loops, controlled spins, fast climbs and rapid descents, the 10 jets make a dramatic impact as they pump out a plumes of coloured smoke immediately prior to take-off. Officially known as the 313° Gruppo Addestramento Acrobatico (313th Aerobatic Training Group), the Frecce Tricolori was founded in 1961. The team is based in northeast Italy and works out of the Rivolto Air Force Base in Udine, Friuli-Venezia Giulia. It replaced teams sponsored by various commands that had been active at air shows since the 1930s. The team was formed by pilots who belonged to the Diavoli Rossi (Red Devils) and Tigri Bianche (White Tigers) patrols. 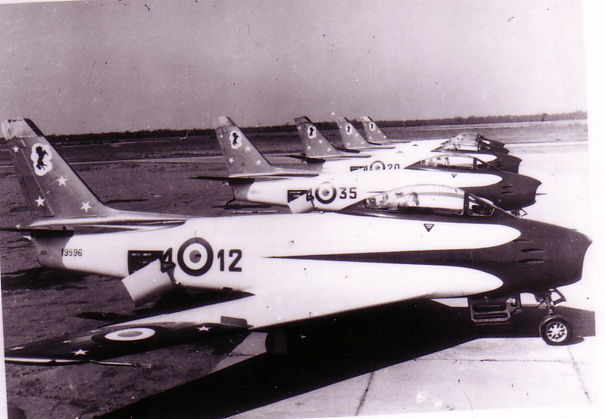 The division was equipped with six CL-13 Sabre jet fighter aircraft from the 4th Aerobrigade that were suited for aerobatic use. Initially, the aircraft sported navy blue livery, with the colours of the Italian flag on the fuselage, and a large sky-blue rhombus containing a black arrow. The aircraft changed their colour scheme, adopting three arrows in white, red and green on their sides with golden-yellow lettering and the words ‘Frecce Tricolori’ written in white on the fin. 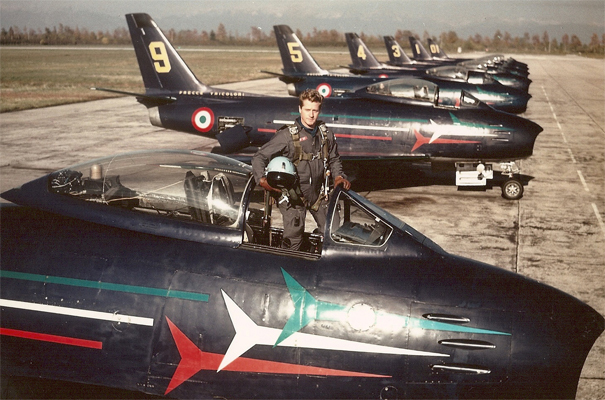 The team got a huge boost in 1963 when it received the first of 20 Fiat G.91 light-tactic fighter jets, which were modified for aerobatic training. The modified aircraft, the G.91-PAN, included a smoke–producing device fuelled by sub-wing tanks and counterweights installed in place of onboard weapons. Thus, the team could produce the vibrant smoke trails emulating the colours of the Italian flag for which it has become famous. The new arrivals also meant that the aerobatic team was equipped with fighter aircraft designed and produced in Italy for the first time since the end of World War II. Thanks to the new aircraft, the Frecce Tricolori were able to develop different flight routines, encompassing low and high flight, and went on to become one of the greatest aerobatic teams in the world. In 1982, the G.91-PAN was replaced by the MB-339PAN military trainer and light attack aircraft. A lighter and nimbler aircraft, the MB-339PAN allowed the team to broaden the scope of its aerobatic displays performed at air shows both at home and abroad, including in the Middle East and North America. The MB-339PAN is the only jet aircraft that can perform a daredevil manoeuvre usually done by sport aerobatic planes, the Lomcevak, in which the aircraft tumbles through the pitch axis end to end while it travels in a lateral direction. The call sign of the Frecce Tricolori pilots is Pony, plus the number of the position in the team; the solo pilot is Pony 10. The peculiarity of the Italian Frecce Tricolori is that, unlike other display teams, the Frecce’s Commander does not fly with the formation. He is the former Leader and issues instructions from the ground supervising the display both from a technical and a flight safety perspective. The formation Leader (called pony #1) guides the whole team, dictating timings and managing separations, aided by the First Slot (pony #6), who flies in the centre, and acts as a reference point for speeds and distances. The Solo (pony #10) is tasked with displaying to the public the aircraft’s extreme capabilities: he flies an almost independent display program, with highly technical manoeuvres in which the aircraft is pushed to the limits of its envelope. The pilots are supported by a team of 70 expert engineering officers, who work behind the scenes to maintain the aircraft. The team performs 18 complex aerobatic formations, including the Big Apple, Triangle Formation Loop and Four-Point Roll. This year, the Frecce Tricolori take to the skies to perform displays in Italy and abroad, starting on 5 May at the Falconara Air Show in Ancona. The group will perform on 26 May at Salon-de-Provence in France, on 14 June at the RNLAF Open Day at Volkel in the Netherlands, and 28 - 29 June at Zeltweg in Austria and 3 - 4 August, the team will perform at Kecskemét in Hungary. The Frecce Tricolori will also participate at the world’s biggest military air show, the Royal International Air Tattoo held at RAF Fairford in England on 20 and 21 July. 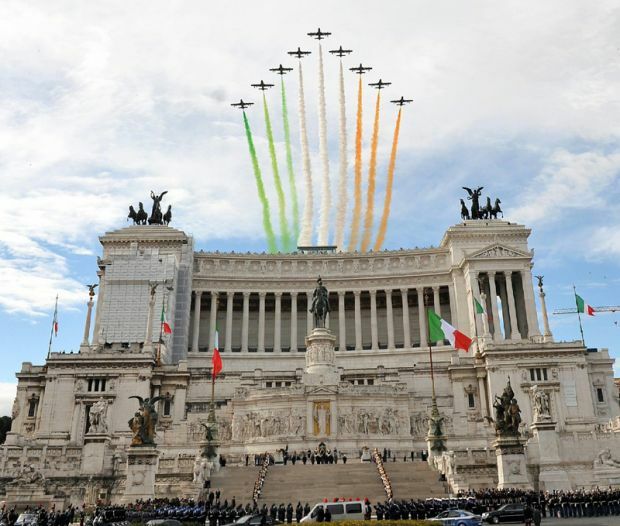 The Frecce Tricolori will round off the year on 4 November in Rome to celebrate the Giornata Unità Nazionale e delle Forze Armate (National Unification and Armed Forces Day). The day marks the anniversary of the unification of Trentino-Alto Adige and Friuli-Venezia Giulia with Italy, as well as the end of World War I. For other dates in Italy have a look at the full Events Calendar.